A gorgeous, well maintained stand alone cottage in the village of Gillamoor in the North York Moors. Comfortable accommodation sleeping 4 in two bedrooms with space for the cot in either bedroom. Ground floor Living room with solid oak floor, Multi-fuel log burner (initial fuel included) four piece leather suite and Freeview flat screen TV with blue ray DVD, 4 steps to kitchen/dining area with stone floor, fully equipped kitchen with electric cooker and hob, microwave, washing machine DAB radio, farmhouse table and 4 chairs and stable door to lawned garden with decked sitting-out area and patio furniture and BBQ. The garden boasts wonderful views towards Helmsley and the south facing garden gets the sun all day. Stairs to first floor with 1 double bedroom with solid pine double bed, hanging space, two small feature cupboards chest of drawers, bedside tables and DAB alarm clock and hair drier. Bathroom with shower over bath, sink and toilet. Stairs to second floor bedroom with twin beds bedside tables, alarm clock and large cupboard with hanging space. The property has oil central heating wifi and electric included. We provide all guests with a welcome basket with tea, coffee, wine, flowers, milk and a piece of artisan soap in the bathroom. Travel cot and high chair free of charge on request. No pets and within the cottage there is no smoking. 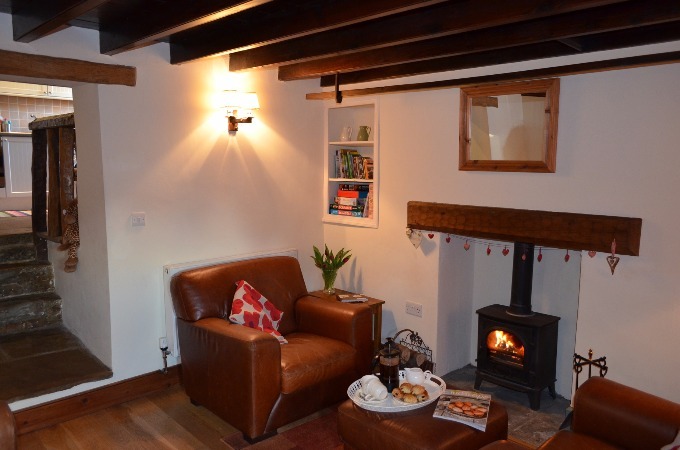 The surrounding area provides an abundance of walking and cycling trails, with many maps provided in the cottage. The Valley of Farndale famous for its daffodil walk, and Hutton le Hole and Rosedale are close by. Market towns at Kirkbymoorside, 2 miles,Pickering 8 miles and Helmsley, 8 miles, offer a choice of shops, inns and tearooms and visitors can travel on the North Yorkshire Moors Steam Railway. York, Scarborough and Whitby are all around a 40 minute drive. The village pub and restaurant is just around the corner they serve fabulous meals, take away fish and chips and eakfasts too! The area is awash with tourist attractions including Flamingo Land, Castle Howard and many smaller independent museums the area is also rich in English Heritage and national trust properties. Short beaks welcome all year except August unless stated on our website. Prices include all linen, towels and welcome hamper. Also included is all electric, heating, first basket of logs and wifi.